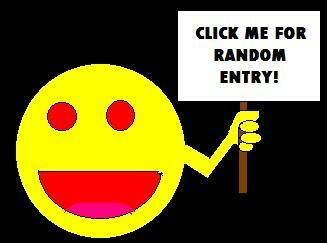 10 Tips for Having a Super Awesome Free Comic Book Day « Midlife Crisis Crossover! Harley Quinn, Spider-Gwen, and Ms. Marvel welcome you to a whole wide world of whimsy and wonder! It’s that time of year again! Today marked the sixteenth annual Free Comic Book Day, the one official holiday in my lifelong hobby when comic book shops across America lure in fans and curious onlookers with a great big batch of free new comics from all the major publishers and a bevy of smaller competitors deserving shelf space and consideration. It’s easy to remember when to pin it on the calendar because it’s always the first Saturday of every May and virtually always coincidental with a major movie release (in 2017’s case, Guardians of the Galaxy Vol. 2). It’s also easy to notice if you live near a comic shop and the parking spaces are much scarcer than normal. I’m too late for this entry to be immediately useful, but for future generations who might be considering participating in the joy of reading and/or the rush for freebies, we offer the following ideas for maximizing your graphic storytelling holiday to the fullest extent, whether you’re brand new to comics collecting or a savvy peer who likes nodding along with solid reminders. 1. Find a local comic shop! Most large cities and many medium cities have comic shops available. If you haven’t noticed one in plain sight, the Comic Shop Locator will help sort you out with pointers to viable options in your area. If you’re among the far too many Americans who live in a comics desert, where no shop is within a fair radius of your home because of the economy or rampant illiteracy or local Footloose-esque laws that oppress comics instead of dancing, I strongly recommend checking with the online comics purveyors who sometimes find ways to deliver the fun directly to you through internet magic. Alternatively: zillions of webcomics are free everyday, so it’s great motivation to go digging. I wish I could better assist with this contingency, but I’m old and addicted to my paper comics. I’m not even crazy about digital music, so I’m the wrong guy to ask for comiXology browsing hints. 2. Plan ahead! The official Free Comic Book Day site posts a list in advance of all FCBD offerings that retailers could choose to carry for the occasion. Not every shop will carry every title, but it’s safe to assume all the major publishers will be represented. At the very least, seeing the potential options should give you hope and stoke your excitement level. 3. Arrive early! Comics are free while they last, but sometimes they don’t last. Sixteen years into this tradition, FCBD has built up decent attendance in most areas, and some titles run out more quickly than others. For the widest selection available, you’ll want to get there while the getting’s good or else there’ll be no more getting to be gotten. What constitutes “early” is up to you — my wife and I usually plan to show up at least 60-90 minutes before the doors are unlocked for the morning. In some states and weather conditions, check the weather forecast and gear up as needed. If the thought of standing in a long line for an hour or more is a turn-off, I do understand. Long lines aren’t for everyone. To us geeks it’s all part of the game. 4. Keep your camera handy! Some shops stage special events the day of. 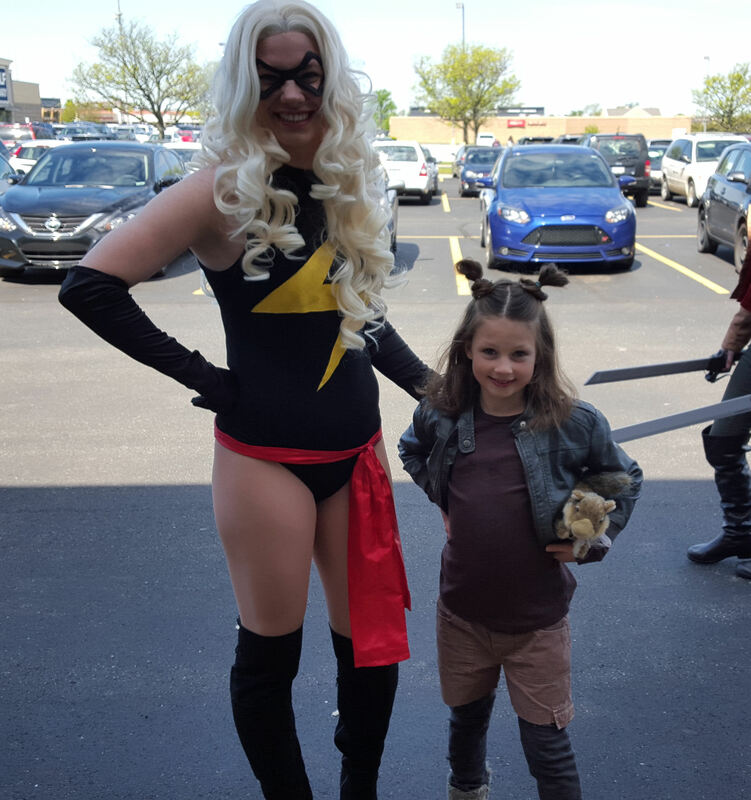 We’ve seen FCBD welcomes and sideshows provided by cosplayers, local fan clubs, actual comics creators, local musicians, charity drives, random Samaritans bearing donuts, face painters, and roller derby teams. One of the many fantastic things about comics is the broad intersection they provide for entertainment lovers from across all media and spheres. You never know what kind of talents will be in the house or interacting with the crowd. If what they do looks cool, you’ll naturally want to commemorate that in picture form for all your friends and followers. Classic Ms. Marvel and the unbeatable Squirrel Girl are kinda like LeVar Burton hosting Reading Rainbow but times 100. 5. Choose carefully! Once you’re inside the door, walk (don’t run because there’s no space for that) calmly to the assigned tables or racks bearing the specific Free Comic Book Day issues designated for the occasion. If the shop posts rules limiting how many you can take, play nice. If they’re cool with you nabbing whatever, that’s fine, but you don’t have to be greedy. You don’t need one of everything, especially not the kiddie-only fare if you’re over 12. Each comic you leave behind means one more fan at the end of the day won’t leave empty-handed and depressed and ranting through tears about how Free Comic Book Day is just a sham holiday that Hallmark made up to sell more Peanuts greeting cards. 6. There is no number 6. Look, there just isn’t, okay? 7. Shop around! Fun trivia most comics fans already know because we remind each other constantly every year: those free comics aren’t free to the retailers. They’re purchasing them from the distributor same as any other comics on sale. FCBD is entirely a voluntary promotion meant as community outreach, which means they’re bankrolling this splendid event from their own coffers, while the publishers still get paid. Comic shop ownership generally sees razor-thin profit margins and moves less than .01% of its careerists into upper tax brackets. So while you’re there…see all those hundreds of thousands of other objects lying around the store? Maybe look through the other comics, graphic novels, toys, T-shirts, and ephemera and buy a thing or two or ten. Not only do you end up with more new things, it’s a nice way of thanking them for their part in this special day and supporting businesses, in that order. 8. Road trip for more! If you’re extraordinarily blessed to live in a city or town that supports more than one comic shop (Indianapolis has at least six or seven), and if you have the time and funds and gas, why not go drop by other shops and see what they’ve made of it. Say hi to more cosplayers, grab another freebie you didn’t see at the first shop, buy even more stuff, keep FCBD alive, repeat until you’re out of either shops, time, money, or space in your trunk. 9. Make time for reading! Congratulations! You now have a reading pile, if you didn’t when you woke up that morning. At some point you’ll need to dive right in and live vicariously through those varied imaginations and universes and licensed merchandise all-stars. Peruse the pictures, absorb the written word, watch those two sides work together in a loving harmony that encourages art appreciation, vocabulary building, and narrative thrills all at once. For the record, #9 is the step where I failed this year. We’ve been so nonstop busy today that…well, there’s a reason why I’m writing this entry at 11 p.m. about what fun we had at 11 a.m. As of this moment I’ve read 4½ of the 15 comics my wife and I selected, and will likely be scrounging for quality reading time tomorrow. Don’t be me: read now, read often, read faster, glare menacingly at anyone who tries to stop you mid-page. 10. Spread the love! Once you’ve finished, what do you do next? Tell other readers which ones were amazing. Write reviews, as I’ll be doing here in the next day or two because it’s what I do. Return to the shop in the weeks ahead to spend more money on those publishers or creators who brightened your life. For extra credit, once you’re done with your FCBD stash, consider pass on a few books to other folks that you think might get a kick out of them. If you’re hoarding them only because you dream of selling them on eBay someday, you’re like the Grinch of Free Comic Book Day yanking stories and inspiration out of the little hands of all the Whos down in Whoville. 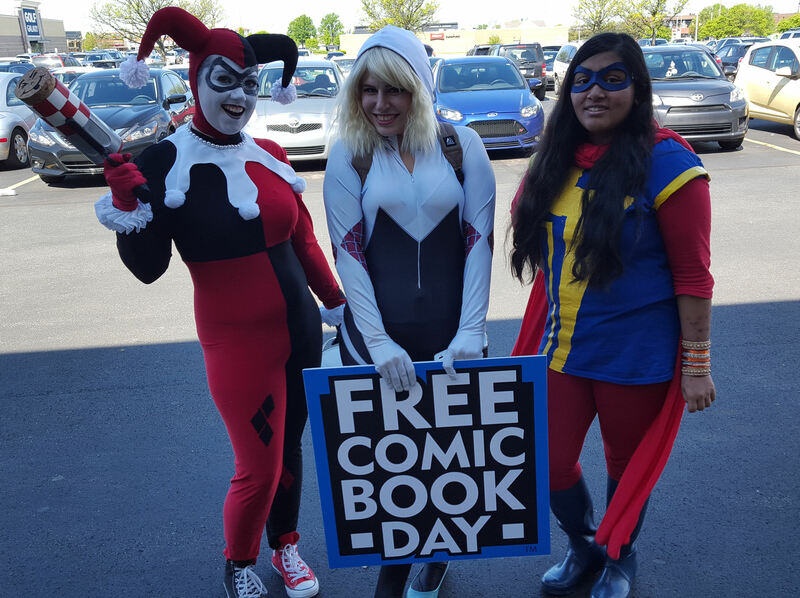 Free Comic Book Day isn’t about fiduciary investment. It’s about the comics. Honestly: duh. Don’t make us have to send Squirrel Girl to your house to beat some super-hero altruism into your head. Our Free Comic Book Day 2017 reading pile, less than half the total titles that were in stock. ‘Twas a good year. Full disclosure: beyond this haul, I also spent money on an issue of Astro City I was missing; the most recent issues of Hawkeye, Angel, and R. L. Stine’s Man-Thing; and Jeff Lemire’s Essex County. Yay comics! « Our 2005 Road Trip, Part 9 of 10: Oklahoma!